Fancy yourself as the next Tony Hawk? So many of us have played the computer games where we wiz around a skate park, but how many of us can actually do the moves and tricks in real life? There are some really fantastic skate parks in the UK, ranging from shiny new parks like Stoke Plaza in Stoke, 3200 metres of skating paradise to more historic ones! For those of you who fancy visiting a truly historic skate park, get yourself down to Harrow Skate Park in south London, one of only two remaining skate parks that date back to the 1970’s that are still open in the UK. It is a great place for skating as well as a great way to meet other like minded people. It has been threatened with closure many times over the years but the local skateboarding community have battled to keep it open. Every year Go Skateboarding Day is celebrated on the 21st June – what could be a better excuse to grab your skateboard and have a go? Zorbing is a relatively new craze that was started in New Zealand. It is a great activity to try if you don’t want to do anything too physical but still want a thrill! When it comes down to it, zorbing is basically rolling gently down a hillside inside a huge transparent plastic ball. There are two basic types of zorb, either dry or wet. 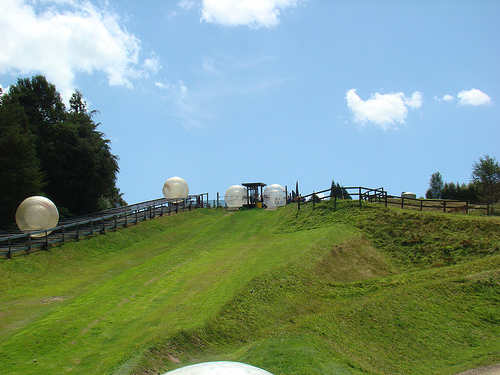 If you choose to go for the dry zorb you are strapped into the enormous ball and if you pick wet, then you can slide and splash about freely as you roll down the hill. Places to try out zorbing are springing up all over the UK, but one of the first was Zorbing South in Dorset that has been established for over twelve years and boasts a 100% safety record. If you are planning a team building activity or a stag or hen do, then zorbing is a great option, as anyone can give it a go! If you are planning a big trip and want to find great group accommodation that is near to the zorbing centre, check out Web Cottages that have loads of holiday cottages in the UK and plenty in Dorset. Skydiving is one of the most thrilling activities that you can possibly try. The free feeling that you get from falling through the air, with just a parachute to stop you is like nothing else. The Lake District is a great place to try out skydiving, the views that you get are truly spectacular and you can really make the most of them once the parachute opens. Bungee jumping in my opinion is one of the most fearless adrenaline activities to try. Unlike skydiving, when at least you are strapped to your tandem partner, bungee jumping means that you have to have the bottle to throw yourself off the edge with only a large elastic cord to save you. The adrenaline rush that you get is like nothing else and it’s relatively cheap too, with jumps costing as little as £50 and centres all over the UK offering bungee jumps. This entry was posted in Air Sports, Land Sports, Skateboarding, Sky Diving, Zorbing and tagged Bungee Jumping, Extreme Sports, Skateboarding, Skydiving, UK, Zorbing. Bookmark the permalink.